Also fluted paper wrappers. Paper wrappers for baked goods. These baking cups come in standard and mini sizes to fit within standard and mini muffin/cupcake tins. You can use them to bake items inside or to place baked items within for serving. They also come in extra-small sizes that are used for truffles and candies. 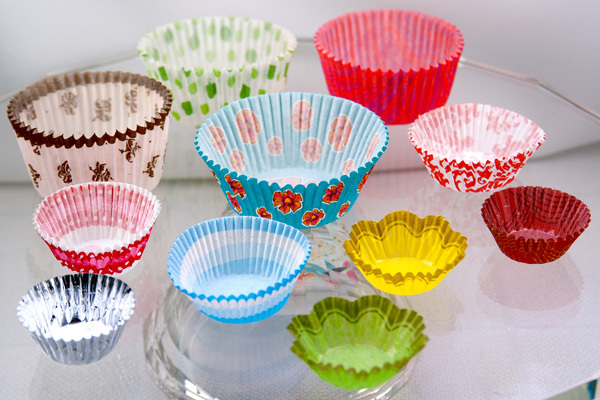 While all sizes have vertical flutes or grooves along the edges, most baking cups have a flat, straight top edge, while others are gently scalloped, which can be seen in the image. While they are referred to as paper, they also come in foil. Colors can be solid or patterned. It is easy to find holiday-themed patterns as well. In the image you can see that some cups are fluted more tightly and the sides are quite vertical, while others splay out a bit. Once they are placed inside tins for baking, this doesn’t make a difference. If, however, you are using them to present baked goods, there is a definite aesthetic difference and you should take this into account. The one with the blue stripes is an example of a mini size, while the red cup to the right of it on the same row is an example of a smaller candy cup. The larger ones towards the back of the image are all standard size. We have noticed that when using foil baking cups that they conduct heat more than the paper ones and can dry out your muffins or cupcakes. Check your baking times, as they might need to be shortened. Also note that a typical golf ball/ping pong ball sized cake ball fits in the mini size for a decorative serving embellishment.